I wanted to help people. But is talking and listening to those people enough? Or simply purchasing souvenirs from them? Was there nothing else I could do? Right now, Mali is facing a scarcity of food. Rainfalls came late last year and were insufficient, which led to harvest failure in the whole West-Sahelian region. Official reports indicate that more than 3,500,000 people directly affected by this crisis are dependent on help from outside the country. ADRA Mali is responding to the crisis through the food distribution project. This project will cover 86,000 beneficiaries from April to December of 2012. It will provide them with more than 4,900 tons of food. The World Food Program provides the food, as well as finances for operational costs. In addition to that, smaller complementary projects will soon be launched to improve lives in affected communities. This will include well rehabilitation, gardening production, etc. The needs are enormous, but we are working and trying to mitigate disaster impacts and save human lives. How did I get here, so far from my home, and how did I join this organization in their work at this time? It’s a long story. One of my long-time hobbies is travelling – visiting different countries, meeting new people, and getting to know their culture – preferably countries that are not high on the list for tourists. Visiting certain countries and seeing people live their simple lives, often in very bad conditions, has always affected me. Traveling for my own pleasure did not seem to be rewarding enough for the time and money that I would invest. I wanted to help people. But is talking and listening to those people enough? Or simply purchasing souvenirs from them? Was there nothing else I could do? It was listening to the experiences of those working on ADRA projects that helped me discover which direction I wanted to take. So when I finished university, I started working for ADRA Slovakia. It was such a worthwhile year! It afforded me the possibility to get out there into the field and serve others. I was also able to get valuable experience while working with the donor office. My first real experience working in the field was in Afghanistan, and later on, in Haiti. These two meaningful experiences helped strengthen my resolve to work in development and humanitarian aid. I looked for these types of opportunities, and one finally came from ADRA Mali through the AVS program. Last March I had to make a decision. I had just returned from my second mission to Haiti. I was there working as a logistic officer in one of the cholera centers of Medecines Sans Frontieres (MSF) after the cholera outbreak in 2010. I was at the MSF Center in Geneva on a debriefing visit and it was there that I was informed that I could continue my career through MSF. I also had the option of serving in ADRA Mali through AVS. They were both wonderful opportunities which allowed me to travel and meet new people. They also allowed me to help others that were less fortunate than me. The only difference was that my salary from the MSF would be much bigger than the stipend I would receive from ADRA Mali. On the other hand, working with ADRA would also be serving the Church, and it seemed to me that helping people by emulating Jesus’ life of service was better than just seeking my own benefits. My decision to go to Mali was a huge step of faith – faith that God would bless me in many ways and provide me with whatever I needed. Now that I have been serving with ADRA Mali for a year, it would be difficult for me to guess if I’d feel as fulfilled and happy if I had stayed with MSF. God doesn’t ever restrict us to just one path. Sometimes, we have to choose between several. But, no matter what, we must allow Him to use us as His instrument wherever we are. No matter which organization we serve – ADRA, MSF or the UN – we must still serve Him. I have never regretted my decision to come to Mali and serve here for ADRA, even though circumstances are not always favorable here. I’ve had many difficulties cross my path. However, I would like to thank God for the many blessings He put into my life by allowing me to serve Him in this country. He has always been with me in this different world, so far away from my home and family. His hand protected me on all my journeys. He stayed by me when I was traveling long distances on African roads crowded with shabby buses. He stood by me when I contracted malaria in Ghana and He protected me again and again from other illnesses that did not attack me. During the political turmoil in Mali in March of 2012, again He protected me by giving me refuge in Burkina. He has even given me a whole new set of friends for which I am so thankful! Despite our different backgrounds and ways of thinking, I see their acceptance of me, and we have spent many wonderful times together! God has put me in a supportive working environment, which has helped me grow. Seeing the ever-smiling faces of the people at ADRA and in Mali have helped me so much through this year, and I will take these smiles back with me to Slovakia. I am even thankful to God for all the difficulties and unpleasant moments that came my way. They help me to remember that I’m just human, and without God’s help and support, I can do nothing. Those moments brought me to my knees, where I sought His power and comfort. I am also thankful to my family, who sent up thousands of prayers on my behalf. Because of them, this assignment has brought me much joy and fulfilment. I am so grateful to the church, AVS and ADRA for giving me this wonderful opportunity and helping me to grow professionally and spiritually. 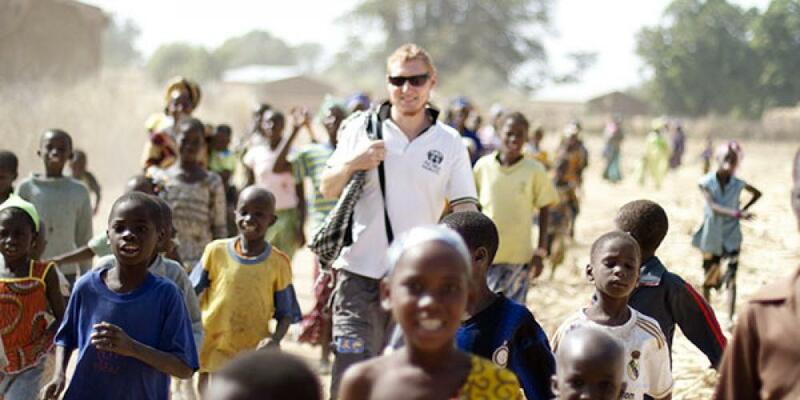 Marek Soos, originally from Slovakia, writes from Mali, where he is serving as a Project Director for ADRA Mali. He began his service in January of 2011 and will continue serving until December of 2012. Marek believes that as a Christian, he should reflect Christ by serving others through his words and actions.